How many times have you tried to buy a present for a loved one or a good friend only to be stuck with what to get them? The usual dilemma of what they like and the repetitiveness of buying the same perfume or aftershave can get a little boring and impersonal after a while. 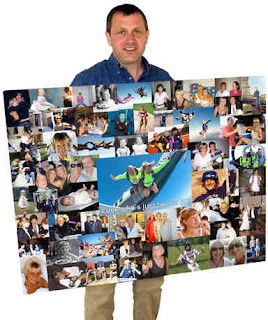 Why not give them a personalised montage and collage canvas print? Montage and collage canvas prints are very personal as it is lots of their photos displayed on a canvas print. They look great, are long lasting and are guaranteed to be a unique present for your loved ones. They come in many shapes and sizes and each design is specific to the person receiving the canvas print. They can be portrait or landscape or even square in size. You can have gaps or no gaps between the pictures. You can have random sizes of images or fixed sizes. In fact the design is really up to you as you know the person receiving the gift more than anyone. They are ideal presents for weddings, anniversaries, birthdays, christenings, mothers day, fathers day, leaving do’s…. The list is endless. If you want an “Oh wow, thank you so much – that’s fantastic!” rather than a simple courteous “thank you” then montage and collage canvas prints are for you.